Happy 35th birthday, global warming! Global warming is turning 35! Not only has the current spate of global warming been going on for about 35 years now, but also the term “global warming” will have its 35th anniversary next week. On 8 August 1975, Wally Broecker published his paper “Are we on the brink of a pronounced global warming?” in the journal Science. That appears to be the first use of the term “global warming” in the scientific literature (at least it’s the first of over 10,000 papers for this search term according to the ISI database of journal articles). In this paper, Broecker correctly predicted “that the present cooling trend will, within a decade or so, give way to a pronounced warming induced by carbon dioxide”, and that “by early in the next century [carbon dioxide] will have driven the mean planetary temperature beyond the limits experienced during the last 1000 years”. He predicted an overall 20th Century global warming of 0.8ºC due to CO2 and worried about the consequences for agriculture and sea level. Global temperature up to June 2010 according to the NASA GISS data. Grey line is the 12-month running average, red dots are annual-mean values. The thick red line is a non-linear trend line. 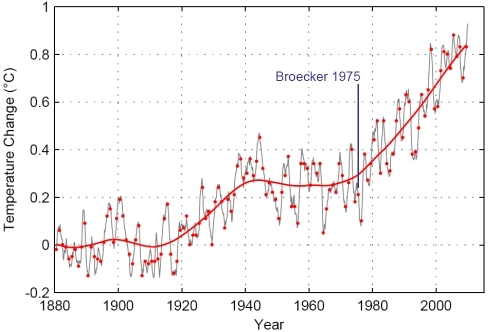 Broecker of course did not have these data available, not even up to 1975, since this global compilation was only put together in the late 1970s (Hansen et al. 1981). He had to rely on more limited meteorological data. Broecker is one of the great climatologists of the 20th Century: few would match his record of 400 scientific papers, a full sixty of which have over 100 citations each! Interestingly, his “global warming” paper is not amongst those highly-cited ones, with “only” 79 citations to date. Broecker is most famous for his extensive work on paleoclimate and ocean geochemistry. It is very instructive to see how Broecker arrived at his predictions back in 1975 – not least because even today, many lay people incorrectly assume that we attribute global warming to CO2 basically because temperature and CO2 levels have both gone up and thus correlate. Broecker came to his prediction at a time when CO2 had been going up but temperatures had been going down for decades – but Broecker (like most other climate scientists at the time, and today) understood the basic physics of the issue. Basically his prediction involved just three simple steps that in essence are still used today. Broecker simply assumed a growth in fossil fuel CO2 emissions of 3% per year from 1975 onwards. With that, he arrived at cumulative fossil CO2 emissions of 1.67 trillion tons by the year 2010 (see his Table 1). Not bad: the actual emissions turned out to be about 1.3 trillion tons (Canadell et al, PNAS 2007 – estimate extended to 2010 by me). If man-made dust is unimportant as a major cause of climate change, then a strong case can be made that the present cooling trend will, within a decade or so, give way to a pronounced warming induced by carbon dioxide. citing a number of papers by Steve Schneider and others. Because he cannot quantify it, he leaves out this effect. Here luck was on Broecker’s side: the warming by other greenhouse gases and the cooling by aerosols largely cancel today, so considering only CO2 leads to almost the same radiative forcing as considering all anthropogenic effects on climate (see IPCC AR4, Fig. SPM.2). To go from the amount of CO2 emitted to the actual increase in the atmosphere, one needs to know what fraction of the emissions remains in the air: the “airborne fraction”. Broecker simply assumed, based on past data of emissions and CO2 concentrations (Keeling’s Mauna Loa curve), that the airborne fraction is a constant 50%. I.e., about half of our fossil fuel emissions accumulates in the atmosphere. That is still a good assumption today, if you look at the observed CO2 increase as fraction of fossil fuel emissions. Broecker calculated that about 35% of the emissions is taken up by the ocean and the other 15% by the biosphere (again not far from modern values, see Canadell et al.). On this basis he argued that if the ocean is the main sink, the airborne fraction would remain almost constant for the decades to come (his calculations extend to the year 2010). Thus, with a 3% increase in emissions per year and 50% of that remaining airborne, it is easy to compute the increase in CO2 concentrations. He obtains an increase from 295 to 403 ppm from 1900 to 2010. The actual value in 2010 is 390 ppm, a little lower than Broecker estimated because his forecast cumulative emissions were a little too high. The response of the global temperature to the atmospheric CO2 content is not linear. As the CO2 content of the atmosphere rises, the absorption of infrared radiation will “saturate” over an ever greater portion of the band. 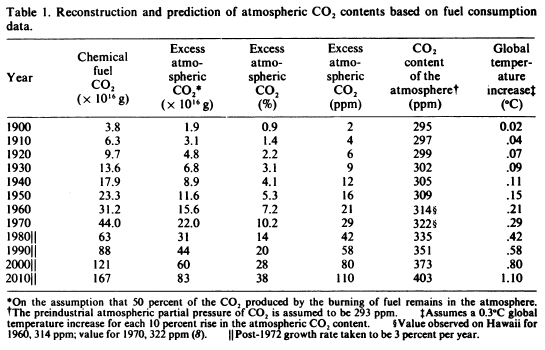 Rasool and Schneider point out that the temperature increases as the logarithm of the atmospheric CO2 concentration. Although surprises may yet be in store for us when larger computers and better knowledge of cloud physics allow the next stage of modeling to be accomplished, the magnitude of the CO2 effect has probably been pinned down to within a factor of 2 to 4. The AR4 gives the uncertainty range of climate sensitivity as 2-4.5ºC warming for CO2 doubling, so there still is about a factor of 2 uncertainty and Broecker used a value near the very low end of this uncertainty range. Modern estimates are not only based on model calculations but also on paleoclimatic and modern data; the AR4 lists 13 studies that constrain climate sensitivity in its table 9.3. Broecker was not the first to predict CO2-induced warming. In 1965, an expert report to US President Lyndon B. Johnson had warned: “By the year 2000, the increase in carbon dioxide will be close to 25%. This may be sufficient to produce measurable and perhaps marked changes in climate.” And in 1972, a more specific prediction similar to Broecker’s was published by the eminent atmospheric scientist J.S. Sawyer in Nature (for a history in a nutshell, see my newspaper column here). has, over the last three decades, more than compensated for the warming effect produced by the CO2 [….] The present natural cooling will, however, bottom out during the next decade or so. Once this happens, the CO2 effect will tend to become a significant factor and by the first decade of the next century we may experience global temperatures warmer than any in the last 1000 years. The latter turned out to be correct. The idea that the small cooling from the 1940s to 1970s is due to natural variability still cannot be ruled out, although more likely this is a smaller part of the explanation and the cooling is primarily due to the “dust” neglected by Broecker, i.e. due to the rise of anthropogenic aerosol pollution (Taylor and Penner, 1994). However, the way Broecker estimated and even predicted natural variability has not stood the test of time. He used data from the Camp Century ice core in Greenland, arguing that these “may give a picture of the natural fluctuations in global temperature over the last 1000 years”. Ironically, Broecker’s own later work on Atlantic ocean circulation changes showed that Greenland is likely even less representative of global temperature changes than most other places on Earth, it being strongly affected by variability in ocean heat transport (see our recent post on the Younger Dryas, or Broecker’s latest book The Great Ocean Conveyor). However, Broecker was right to conclude that the buildup of CO2 would sooner or later overwhelm such natural climate variations. Overall, Broecker’s paper (together with that of Sawyer) shows that valid predictions of global warming were published in the 1970s in the top journals Science and Nature, and warming has been proceeding almost exactly as predicted for at least 35 years now. Some important aspects were not understood back then, like the role of greenhouse gases other than CO2, of aerosol particles and of ocean heat storage. That the predictions were almost spot-on involved an element of luck, since the neglected processes do not all affect the result in the same direction but partly cancel. Nevertheless, the basic fact that rising CO2 would cause a “pronounced global warming”, as Broecker put it, was well understood in the 1970s. In a 1979 TV interview, Steve Schneider rightly described this as a consensus amongst experts, with controversy remaining about the exact magnitude and effects. BROECKER WS, 1975: CLIMATIC CHANGE – ARE WE ON BRINK OF A PRONOUNCED GLOBAL WARMING? SCIENCE Volume 189, Pages 460-463. Wishing you a wonderful. . . Most depressing “Happy Birthday” ever. And, in a comment with a bit more substance: that paper’s held up really well over time. I guess there’s a damn good reason it was published in Science. The existence of this paper is also good to use against the folks who talk about “global cooling” (yes, I know there’s another RC thread devoted just to that topic!). Wally has always been the king of the back-of-the-envelope calculation. This is just one example, and shows how he developed a simple model of CO2 and warming that got within 15% of what actually occurred over 35 years. A note on early predictions of CO2-induced warming: the New York Times published an editorial on March 24, 1953, entitled “How Industry May Change Climate.” I have a PDF of it, which begins “The amount of carbon dioxide in the air will double by the year 2080 and raise the temperature an average of at least 4 per cent…” The editorial also mentions a recent paper presented by Gilbert Plass at AGU, which I haven’t looked up. So the potential effects of CO2 on climate have been appreciated for a long, long time. * In 1952 — fifty years ago — the Paley Commission reported to President Truman that, “Efforts made to date to harness solar energy economically are infinitesimal. It’s time for aggressive research in the whole field of solar energy — an effort in which the U.S. could make an immense contribution to the welfare of the whole world.” The report concluded that solar could play a greater role in energy production than could nuclear power, and that an aggressive effort could heat 13 million homes and offices by 1975. * One year before that date, in 1974, even the Atomic Energy Commission admitted that by 2000, solar could provide 30% of the nation’s energy needs. * In 1972, the American Institute of Architects published its study called: “A Nation of Energy-Efficient Buildings by 1990.” Their study concluded that readily available energy conservation measures installed in old and new buildings would offer an energy supply greater than what we could get from the Alaskan North Slope, or domestic oil production in the continental U.S., or an overly optimistic prediction of nuclear energy output. Thanks very much for posting this. I normally try to stay aware of such milestones and anniversaries, but this one completely slipped by me. This raises an issue that I think will increasingly become a sticking point in humanity’s response to this situation: When can we fairly say that we knew with reasonable certainty that climate change was real and that it was largely human caused? I do NOT want to bring up here the arguments about which country or group of countries (i.e. the OECD) is responsible for how much of our predicament, although that’s largely the context in which this question is asked. Putting the political aspect aside, I would really like to hear the opinions of the RC regulars, both real scientists and the scientist wannabes (like me), on what date you would pick on a time line and say, “by this point we knew about the A in AGW and there was very little doubt, even if we had a lot of uncertainty about the amount of warming and interactions between various parts of the environment, and we should have started to take action to reduce our emissions”. I know about the report to LBJ from the Presidential Science Advisory Committee in 1965 (and its Appendix Y4) and the 1958 booklet from the NAS that talked about CO2 and water vapor being greenhouse gases, but it’s never been clear to me exactly when it would be reasonable to say that the evidence was not just strong enough but also widely accepted enough by scientists that the rest of us should have taken notice and done something other than buy more cars and bigger houses. Ben(5): How long is that NY Times article? I couldn’t find it online, and would love to see it. I’m a bit too young to celebrate this one. I am curious about the apparent lack of warming observed over the 20th century for North America. I wonder if perhaps the increase in ‘dust’ from Asia that was occurring just as the ‘dust’ generated in North America could perhaps be responsible. I would really like to hear the opinions of the RC regulars, both real scientists and the scientist wannabes (like me), on what date you would pick on a time line and say, “by this point we knew about the A in AGW and there was very little doubt, even if we had a lot of uncertainty about the amount of warming and interactions between various parts of the environment, and we should have started to take action to reduce our emissions”. Nevertheless, the basic fact that rising CO2 would cause a “pronounced global warming”, as Broecker put it, was well understood in the 1970s. In a 1979 TV interview, Steve Schneider rightly described this as a consensus amongst experts, with controversy remaining about the exact magnitude and effects. Our understanding in 1979 may not by itself have implied a call to action at that point, but we’d already suffered through the 1973 oil embargo, knew that U.S. strategic and economic fortunes were tied to a resource we could not necessarily control, knew of other reasons to switch (pollution, ultimate limits to fossil fuel availability, etc. ), and knew that other technologies were seemingly within our grasp. Imagine if we’d started taking action in 1979, where we’d be environmentally, climatically, economically and strategically. Imagine how small the expense (which is the denier’s sticking point) would have been if the issue had been approached gradually but continuously since 1979. Heck, we might never have fought two wars in the Persian Gulf. Which leads to another side point. Why haven’t we developed and implemented acceptable solar energy solutions? There are three sources of power on this planet; nuclear, tidal, and solar. 99.99% of all power we see on earth (plants growing, animals moving, winds and waves moving, light and heat) are a result of solar energy. Even fossil fuels are, in fact, solar energy. So if the sun is in effect the source of almost all power on the planet, and nature has been able to easily transform it into wind, waves, life, movement, and hydrocarbons on a daily basis, why are we so crippled and incompetent in extracting what we need from it? Those are interesting reads. It looks like the fundamentals have been in place for a long time. It’s depressing that so little has been done to mitigate things — it’s like turning around an aircraft carrier with a paddle. Stefan, do you have any Happy Birthday insights re future prospects for sea level rise? Does anyone have a clip of Svante Arrhenius talking about AGW. . . back around 1896??? Hmmm… I better try Google. @7 Lou: When did we know with reasonable certainty that AGW was real? What you mean, “we”? Wally and Steve Schneider and lots of others knew it by the late 1970s, but many scientists and still more non-scientists found lots of valid reason for doubt. I think you can’t pick a better date than 2001, when the IPCC officially announced that there was a “discernible” human effect on climate. At that point “we” included the overwhelming majority of experts and the official consensus of most of the world’s governments. At any time before that, you could say there were defensible reasons for doubt. Another possible date would be 1988, when the international Toronto conference of experts called for strict, specific limits on greenhouse gas emissions. This represented a consensus (incomplete) of scientists that there was reasonable certainty that AGW was, if not beyond doubt, at least enough of a risk to warrant real action. FWIW, I personally became convinced in the late ’90s. The last straw was evidence that GCM’s had correctly reproduced the very different conditions of ice-age tropical ocean temperature; I suppose everyone has their own personal last-straw. Bore-hole demonstrations of 20th century warming also played a role in convincing me. Although in all science,conviction should never mean more than, say, 95% sure… there’s always a remote possibility of being wrong. oops, my bad, “discernible” was from the 1995 IPCC report (another milestone). The 2001 report more definitely declared that “most of the observed warming over the last 50 years is likely to have been due to the increase in greenhouse gas concentrations” where “likely” falls only a little short of reasonable certainty. Thanks Stefan for that news. A triumph for science, not so good news for humans and the planet. But I guess that is the issue. The message is negative and that goes against the grain for many humans. Excellent post on an excellent paper. I’m surprised this paper isn’t the standard response to the denier “point” that global cooling was imminent according to scientists in the mid 70s. That’s quite a trick. Assuming they meant “degrees F” they were quite accurate for 57 years ago. Good article. I recall Richard Alley in his book “Two Mile Time Machine” mentioning that if you’re a climate scientist, and you think you have a good idea, chances are Broecker already got to it first. He has done extraordinary work and this paper is no exception. In response to John Reisman (14), Arrhenius was not interested in anthropogenic global warming. He did do the first quantitative outlook of the effects of CO2 changes on global temperature (of which he got very lucky in being close to modern estimates), but his target was largely to examine the coming and going of ice ages. If you want to go back and extend the “birthday of global warming” Callendar is probably the first person to look at. Thanks Chris, I seem to recall something about Arrhenius saying if humans increase CO2 it would be great because we don’t want to go into another ice age. It might have been from Spencers work, but I will have to dig around. Yes, Callendar was on top of this. I think as early as 1924 or 26? #7 Lou Grinzo. For me, the A-part of GW became evident a bit after 1995 report, probably 1997/8 winter after checking some things in the report from the original articles in the university chemistry library. C13/14 uptake by plants produced some confusion afterwards, but this was cleared soon after, 1999? Towards the end, I include an image of a 1953 Popular Mechanics “sidebar” squib on global warming sourced to Gilbert Plass–a scientific correspondent of Callendar’s (as was Keeling.) I haven’t read the letters beyond a few excerpts quoted by Fleming, but I’ve the idea that Callendar was a bit of a long-distance mentor–to Plass especially. Perhaps someone with connections can persuade the NY Times to open it for free viewing. Stefan, thank you for an absolutely fascinating post. A terrific review and reminder, both the post and the linked references, thank you. The situation was already sketched out in the 60’s and 70’s, becoming increasingly clear ever since. Making the world’s (mostly non-) reaction all the more tragic, in the sense of a horrific outcome due to ineradicable human flaws. There is still time to make the future better than it would be without recognition and action, though probably not time to avoid many heartbreaking losses. SecularAnimist, how about this paraphrased quote from T. Edison in 1910: The nickel-iron battery will put the gasoline buggies out of existence in no time? If Broecker’s original title included the “Climatic Change” part, then it’s kind of remarkable that this foundational paper that first introduced the term “global warming” also exemplifies the tension between the use of that term versus the use of “climate change” … in its very title. That was when we should have made global warming a non-event. The framework Convention is a legally binding treaty, but it simply states that we all see there is a problem, and does not tackle how to go about solving it. That was left for the 1997 Kyoto Accord, which was a Protocol to the Framework Convention. The UNFCCC set up the annual meetings known as “Conference of the Parties” or COP. We’ve kept holding those, recently completing COP-15, and are working up toward COP-16 in Cancun, Mexico this coming December. The Kyoto Protocol is still in force today, for those Parties (countries) who ratified it. It governs the period from 2008-2012 for Annex I parties, who are obliged to meet whatever target they set for themselves in the course of the negotiations, stated as a % reduction in emissions from a 1990 baseline. So by the reckoning that 1992 was the year the world community acknowledged the problem, we’re now in year 18 of dithering over whether to do anything to slow and someday start cutting emissions. This could at least remove one of the main stated objections behind Byrd-Hagel in the U.S., though other objections such as “devastate the economy”/ “it’s a tax” may remain key moves in U.S. inactivists’ playbook. Global warming causes the climate to change. Seems pretty straightforward to me. My Jr. High School science teacher told us about global warming. This was in the 1950’s. Forgot to mention, what a great post, thank you Stefan. Humbling to see somebody wade through so much material and make it tractable for those of us a mile wide and an inch deep. One part makes no sense. You state that “based on this logarithmic relationship (still valid today) Broecker assumes a climate sensitivity of 0.3ºC warming for each 10% increase in CO2 concentration, which amounts to 2.2ºC warming for CO2 doubling.” I certainly understand the logarithmic relationship – that’s straight 2nd law stuff. But then you go on to linearly extrapolate the temperature. This doesn’t make sense. Assuming the first 10% increase in CO2 leads to a 0.3C warming, then ln(10) = 2.303. 0.3 and 2.3 should be proportional – the ratio is 0.13. Doubling the CO2 concentration requires taking ln(100), or 4.6. Employing the same ratio yields a temperature increase of 0.6 C, not 2.2. I have never understood this. From the second law, chemical activity is proportional to the logarithm of the concentration, and yet the temperature increase is always calculated linearly, as in your example. On a logarithmic scale, the doubling of CO2 concentrations is, frankly, not especially significant. Actually back in early 1979 I would have been writing up my final project report for my diploma at a further education college here in the UK. It was titled ‘Sun Tracking for Solar Cells and Parabolic Reflectors’. I remember making the mechanism out of Meccano and burning out the only transistors I had trying to drive the motors. I still have the (rather good) report, which has a hand drawn graph of the spectrum of sunlight reaching the ground, with the visible band clearly marked. I’m sure I probably copied the graph out of a book. Dan King – I think you are getting confused with percentages. It’s not log of 10 or 100 that you need to take, it’s log of 1.1 and 2 – log 2 is a bit more than 7 times log 1.1, so the increase in temperature for a doubling of CO2 is a bit more than 7 times the warming you get from a 10% increase in CO2. Sorry, but that still makes no sense. The absorption and emission of IR radiation by CO2 is a chemical process, and MUST be related to the second law. There is no escaping that. I don’t know what “forcing” means, so I don’t really understand. But whatever it is, I can’t believe it turns a logarithmic process back into a linear one. 10% doesn’t imply log(10). It implies log(1.1), since a 10% increase of 1 (being the “present” level) is 1.1. And, log(1.1) (using natural log) is 0.0953. Meanwhile, log(2) is 0.693. The ratio log(2)/log(1.1) is 7.27, so we need 7.27 increases of 10% (compounded) to achieve a doubling. If each 10% increase raises temperature by 0.3 deg.C, then 7.27 of them would raise temperature by 2.2 deg.C. Dan King: You obviously made a basic error, because if you are right that “Doubling the CO2 concentration … yields a temperature increase of 0.6 C” then clearly a rise of 0.6 is the same as two rises of 0.3 each. And if 0.3 is produced by a 10% increase, then two 10% increases are plainly not the same as a doubling. Thank you for your patience, and I admit I’m a novice to this. But I do know my thermodynamics. Taking your statement as correct – that “forcing”, whatever it is, is proportional to the log(CO2), then increasing the CO2 concentration from 1.1x to 2x should result in multiplying the temperature by a factor of 1.8. It doesn’t matter how many processes are involved: 1, 10, 135. There is no way that anything can depend exponentially on the concentration, which is what the ratio log(2)/log(1.1) implies. OK – so I’ll shut up and leave you folks alone. Thanks again. Really sixty publications with over 100 citations? Wow. Impressive. My wife was a researcher on James Burke’s documentary “After the Warming”, which came out in 1990. It was already abundantly clear then that warming was going to happen, and that it was largely due to anthropogenic causes. We watched it again recently, and it is scary how accurate JB’s predictions were – although things that he said would only start happening in the 2020s or 2030s are already happening now. Every time I hear someone declare that climate science is an “immature” science, or that we need to wait for more evidence, I want to sit them down in front of “After the Warming”, and ask how much longer we need to wait. Dan King, I think you are confusing the relationship between CO2 concentration and radiative forcing, and the relationship between global temperature and radiative forcing. The “forcing” by the way is just a measure of how the net radiative balance of the planet is perturbed by a change in solar irradiance,greenhouse gases, etc. That alone doesn’t tell you anything about the temperature change realized at the surface, since this also depends on how sensitive the system is to that forcing, which depends on feedbacks. For a change in CO2 concentration, the forcing is given as RF_CO2=k*ln[CO2(t)/CO2(0)] where k ~ 5.35 W m**-2 and CO2(t), CO2(0) represent the final and initial concentration. Thus, a 10% change in CO2 (e.g., from 300 ppm to 330 ppm) corresponds to a forcing of 5.35*ln(1.1)=0.5 W m**-2. A doubling of CO2 would be RF_CO2=5.35*ln(2)=3.7 W m**-2.
note that previous comments are using λ closer to 0.59 degrees C/(W m**-2) but the implications for this discussion are the same. It follows from this that the logarithmic dependence of the outgoing longwave radiation (which by the way, has to do the the exponential decay of the absorption coefficient away from the center of the absorption line) can still lead to significant temperature changes, particularly since water vapor enhances the value of λ and smoothes out a plot of the outgoing radiation vs. temperature (making it more linear than T**4). The log dependence though does mean that incremental changes of CO2 produce forcings smaller than the last similar incremental change (e.g., the forcing from 200 to 400 ppm is the same as the forcing from 500 to 1000 ppm, not 500 to 700 ppm). This is fortunate because if it were not the case, then CO2 doubling would be lethal and the Earth would be subject to extreme changes in climate. This is not the case, but it doesn’t mean the Earth is insensitive to change. I doubt it is the first. How can anything survive in a climate like this? A heat wave all year long. A greenhouse effect. Everything is burning up. “American Graffiti,” set in 1962, is in part a love affair with cars. Now we know where the denialists cherry picked the “saturation” idea from. When should we have done something: Without the influence of coal industry propaganda and lobbying: There would have been zero large fossil fueled electric power plants after 1970. A world of scientists would not be in this pickle. There is an evolutionary hurdle here. Can we get over it? Per SETI, E.T. seems not to have gotten over the evolutionary hurdle. I’m so grateful that RealClimate exists. Today I read a news article about global warming on Yahoo (nothing startling in it, just that yes, the world is getting warmer, like we’ve been saying), and after reading the comments, remembered why I never read the comments. (It was this one, if you want to get a taste of what I mean: http://news.yahoo.com/s/ap/20100728/ap_on_sc/us_sci_state_of_the_climate) Post after post after post decrying that global warming exists, that it’s caused by humans, that it’s even a bad thing. Ignorant, blind excuses for reasoning are offered up as if they’re fact, making me wonder if we have any hope at all. After all this time, after the mountains of data, after the lives dedicated to finding the truth, people still look away, still deny its existence. Happy birthday, global warming, you may have the last laugh at our stupid species. But then … I come here … and I have a flicker of hope. Thank you.